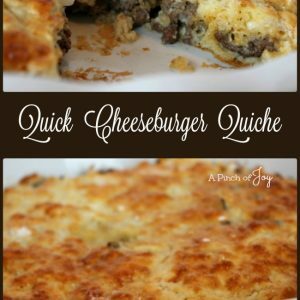 Quick Cheeseburger Quiche was probably originally a Bisquick Impossible recipe, but we’ve always called it cheeseburger quiche. Maybe to fool the mommy cook – or the small diners and their daddy — into thinking there was an exotic gourmet dish on the table in the after work scramble! It’s a great weekday meal – about 35 minutes from start to steaming finish. When I started looking for lower carb options, this recipe surprisingly filled the bill! It is 10 carbs per serving and has 29 grams of protein to recommend it – besides its tasty heartiness. 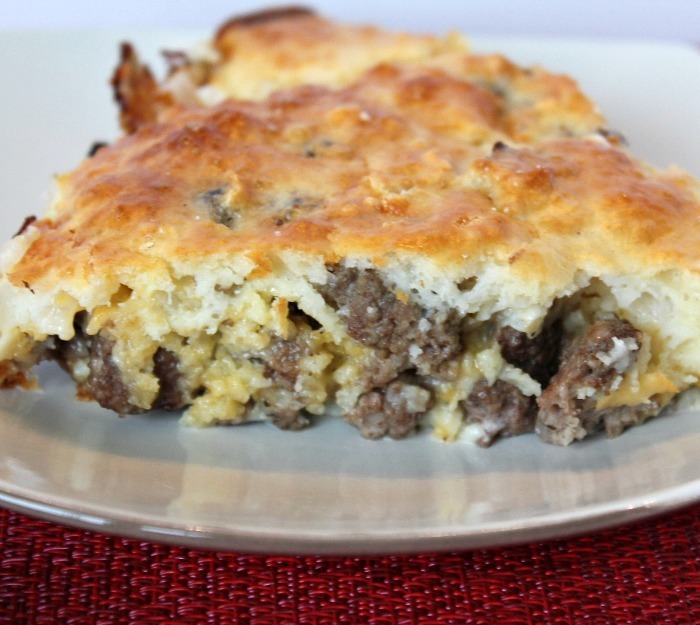 This goes together quickly – especially if you keep browned ground beef on hand. If you like a bit of Italian flair, try adding Italian seasoning along with the salt and pepper. 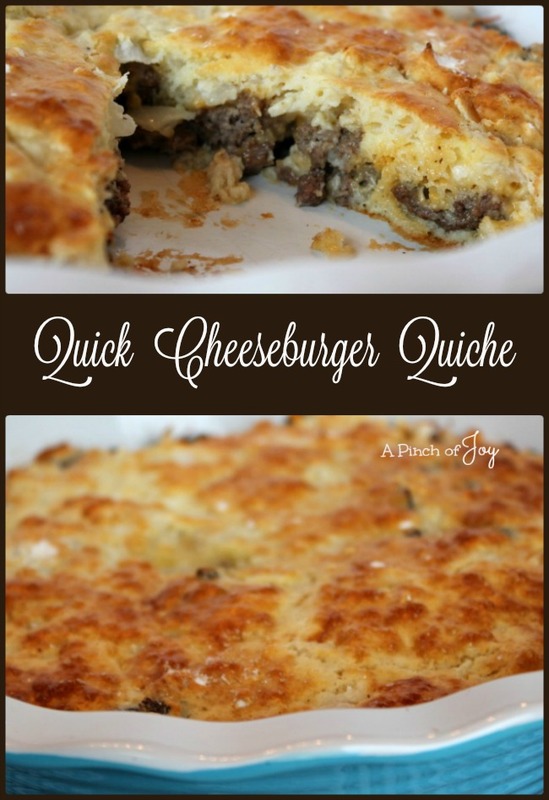 You can also vary the cheese and use monterey jack, colby jack or any other yellow cheese or combination thereof. Served with hot vegetable and crisp salad, this is a good dish for those cool fall days. 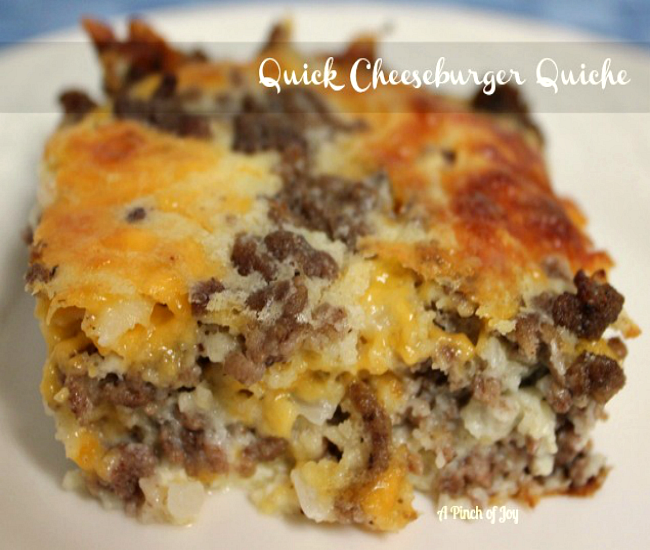 Hot and filling, stick to the ribs comfort food with savory ground beef and cheesy goodness. Quick and easy, low carb. Brown ground beef and drain excess fat. Spread evenly in bottom of baking pan. Distribute the next four ingredients evenly over ground beef. In small bowl, mix together milk, eggs and baking mix. Pour over meat and seasonings.